Steph Curry had a pretty impressive game scoring 34 points! What stole the show at his press conference though was his little girl who is just simply adorable. She's a true daddy's girl... taking over his life and in full control. The press got a kick out of her cuteness and her little personality. 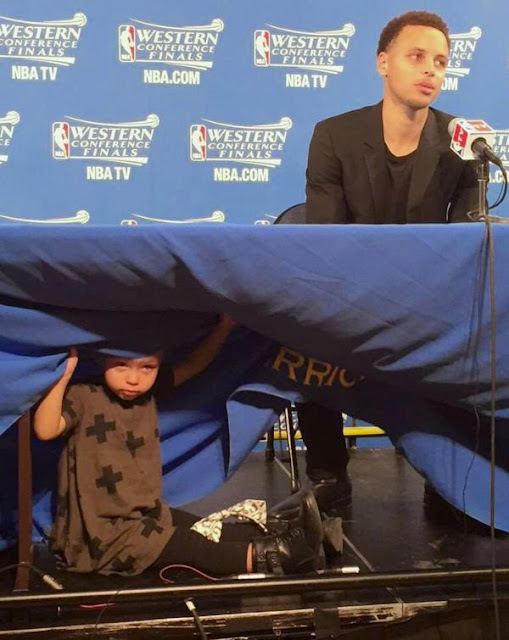 Steph joins a few fellow players who have brought their kids with them to their press conferences. I don't know if its something they're consciously doing or if the kids are demanding to go with Daddy to the stage. Either way, I'm loving it because it gives us an opportunity to see these men in an even more positive light.. plus their kids are just TOO cute! Check out Steph's little girl in action taking over the show below! If he hasn't already he needs to quickly find this baby a television show to be on or something! She's ready! The final score was 110- 106 Warriors.